If you’re having trouble achieving your goals, what you need might be a little social pressure. That’s the idea behind GoalHawk, a new startup in the current Teens in Tech incubator. Right now, GoalHawk is focused on fitness and programming. Granted, there are already plenty of social tools in these areas — that’s particularly true with fitness, but even on the programming side, Codecademy has social features. However, GoalHawk isn’t focused on any particular subject or industry, and is instead trying to build a broader platform for tracking your goals. The social dynamic is also more active — instead of just passively sharing their achievements, users actually get nagged by their friends if they don’t meet their goals. 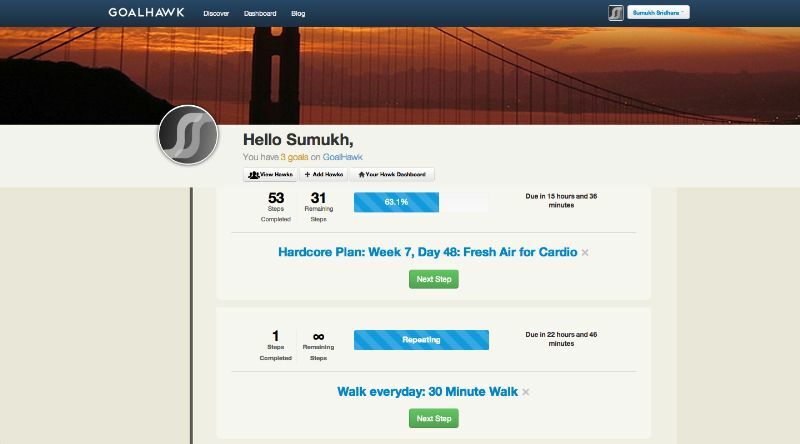 Right now, when you visit the GoalHawk site, you select either fitness, programming, or custom goals. If you’re not building your own custom plan, you choose a set of goals that comes from a partner site (the initial partners include MusclePharm, BodyBuilding.com, and Codecademy). Then you identify three to five Facebook friends who might support you in following the plan, and you send them a message asking them to help out. One everything’s set up, GoalHawk will start giving you goals and deadlines, and you’re supposed to update the site every time you achieve a goal. If you miss a deadline, GoalHawk tells your friends that you slipped, and they’re invited to send you an encouraging message. It’s not just about nagging — your friends can also make pledges, for example promising to take you to a movie or buy you dinner if you reach a certain milestone. And ideally, those supporters would turn into GoalHawk users too, so that you’ve got a network of friends who are all trying to achieve their own goals, and lending support to each other as they do. The company was founded by Sumukh Sridhara and Mark Daniel, who are both about to start college. (Sridhara at UC Berkeley and Daniel at Babson College.) Both of them say they plan to continue working on GoalHawk while at school, and if it really takes off and demands their attention, they’re willing to devote themselves full-time to the company.